There’s fake news. And then there’s fake history. Fake news lies about the world as it is. But fake history is the context for fake news. Fake history sanctifies abominations past and present. Fake history erases the struggle over thousands of years between those many who produced the planet’s wealth and the greedy few who appropriate it for themselves. Being born in the U.S. the middle of the 20th century, I got the same massive doses of fake history as everybody else. They told me told the Greeks were the world’s only early adopters of democracy. I was taught the fairy tale of the Pilgrims’ first Thanksgiving. I played cowboys and Indians. My history books spoke glowingly of the Manifest Destiny bestowed upon white America to devour the continent of North American, murdering and dispossessing its inhabitants. I learned a very little about slavery in school, very little, and much more, almost everything of any value, afterward. And like everybody else, I was treated to an entirely fabricated history of the Second World War. Lying about World War 2, what came before and afterward, was and remains today a central facet in the U.S. mythology which justifies and undergirds its settler state at home and its global empire abroad. Briefly, we’re taught that Nazi Germany was just plain inexplicable evil, that this Hitler dude came to power with his Nazi party, they persecuted Jews, gypsies and dissidents, they conquered France and they menaced England but were stopped short when they lost the battle of Britain in the air. Eventually the U.S. joined the war, invading North Africa, defeating the Nazis there, going on to fight the Germans in Italy, and eventually staging the D-Day invasion of France. They marched into Germany to finally defeat the Nazis and hanged a number of Nazi officials for war crimes and genocide at Nuremberg. The Russians, the Soviet Union at the time, we were taught, were sort of in the war too as allies but soon after the defeat of the Nazis they became enemies, and have been that ever since. Nearly all of that is horseshit. When the Bolsheviks took power in Russia in 1917, the U.S. used troops already in Europe to fight the Germans in World War 1 to join with Britain, Japan and more than a dozen countries and invade the new nation, taking part in the bloody and disastrous Russian Civil War. The Bolsheviks won that civil war and founded the Union of Soviet Socialist Republics, the world’s first avowed socialist country. The U.S. did not diplomatically recognize the USSR until 1933, and ruling elites in the U.S. and Europe conspired constantly to undermine and subvert the USSR at every means and at every turn. In February1933, a month after Adolf Hitler became chancellor of Germany, a mysterious fire in the Reichstag, the German Parliament building was blamed on the Communists. It became the excuse to grant absolute power to Hitler and his Nazi party, which promptly opened up concentration camps for communists, socialists, union members, Jews, gypsies, dissidents of all kinds. Nazism became the official ideology of the German state, holding among other things that the main threat to civilization was Jewish-led communism. Hitler spells it all out in a book called Mein Kampf, how Germans were the center of a so-called Aryan race destined to rule over the rest of lesser humanity, and obligated in the very short run to make war upon the subhuman populations to their east from Poland to the steppes of Russia and Siberia, also eliminating communism from the face of the earth. Hitler very much admired the example of North America, which he regarded as an exemplary model of white supremacist conquest, murdering and thoroughly dispossessing a native population. He named his personal armored train Amerika. Western elites including prominent U.S. corporations like Texaco and bankers who included the Bush family, and IBM did business with Hitler and aided the rearming of Germany. In 1939 and 1940 Nazi Germany absorbed Austria, Czechoslovakia, invaded Poland and beat the French army down enough to force French leaders, many of whom sympathized with the Nazi ideology anyway to collaborate with Hitler. Germany bombed Britain but stopped short of invading the British isles to turn east toward the Soviet Union, and the ultimate Nazi goals of conquering and displacing entire populations of what it regarded as subhumans there and ending communism once and for all. The Nazi invasion of the USSR was, all by itself the largest and bloodiest war in human history. Germany sent more than 3 million men in 149 divisions into Russia. They plundered and burned and razed entire rural districts, villages, slaughtered the populations of entire ancient cities, and made a point of rounding up Jews and communists. In many places they found significant numbers of like-minded collaborators. They killed millions of Soviet civilians and soldiers, and aimed to starve out the Russian population to make room for German settlers in the near future. Multiple standalone battles, like Stalingrad in 1942-43 or the 900 day siege of Leningrad accounted for a million or more deaths each, dwarfing the U.S. loss of some 400,000 during the entire war in both the Atlantic and Pacific theaters. The USSR lost 26 million lives in the war, about a third of them military the other two thirds civilians starved or murdered. The USSR spent a million lives liberating Poland, and another million plus liberating Hungary, Romania, parts of Yugoslavia and elsewhere in Eastern Europe. The battle of Berlin alone cost the lives of another 200,000-300,000 Soviet soldiers. The USSR is 25 years gone now, but Russians remember. The USSR begged Britain and the U.S. to open a second front in the west, and Franklin Roosevelt promised to do just that before the end of 1942. But he allowed the Brits, led by Winston Churchill to dissuade him. Britain thought it more important to preserve its own empire, first by securing the link to India and the Far East through Suez, so the Americans landed in North Africa instead of France. Some American politicians, like Harry Truman who would succeed Roosevelt as U.S. president argued that the U.S. should help the Nazis if the Soviets were winning and the Soviets if the Nazis were winning so as many as possible would die. When the North Africa campaign was wrapped up, the Americans and Brits invaded Italy instead of France, prompting U.S. General George Marshall to accuse his superiors of “periphery pecking” instead of fighting the war. The U.S. conducted bombing raids from bases in Britain, but delayed its land invasion of France till June 1944 when the defeat of Nazi Germany was already assured, and the outcome of the war no longer in doubt. There’s a famous photo of U.S. Marines raising a flag at the end of the horrific battle of Iwo Jima in the Pacific. But there are no pics of Brits or Americans raising the Union Jack or the stars and stripes over the ruins of Berlin in 1945. That’s because the Brits and Americans never got to Berlin, they never intended to. American forces never faced more than an eighth of the German land forces at any time during World War 2. 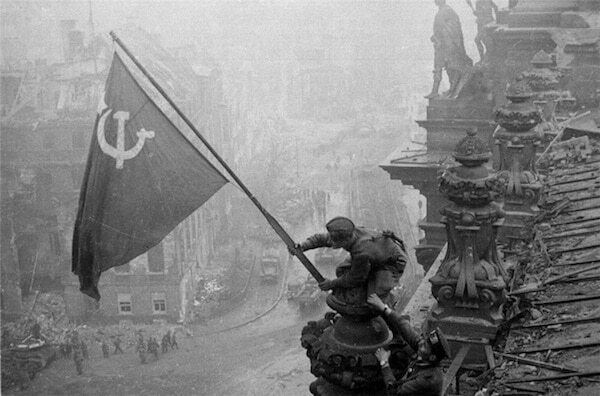 The Soviet Red Army raised the hammer and sickle over the Reichstag at war’s end. At the victory celebration in Moscow, the Red Army threw the hundreds of the banners of Hitler’s legions on the pavement before Lenin’s tomb. The Brits and Americans didn’t capture enough of these to make a good parade. US president Roosevelt died 3 weeks before the Nazi surrender, and was succeeded by Harry Truman, who instantly adopted a profoundly hostile policy toward the USSR. American use of the first atomic bombs against Japan, which had been seeking to surrender was perceived as a threat to the USSR, rather than a military necessity to end the war. U.S. intelligence agencies aided the escape of thousands of Nazi war criminals to the Western hemisphere. America placed other ex-Nazis in positions of responsibility in the German regime set up in their occupied zones, and prevented the early reunification of Germany, turning the boundary between Soviet and Western occupation zones into a fortified international border. Truman’s warlike stance against communism and the USSR was inherited and greatly expanded upon by his successors, former General Dwight D. Eisenhower and John Kennedy, both of whom menaced the USSR with nuclear weapons and placed nuclear missiles in Turkey next to the Soviet borders. Russians remember this too. Sixty million people perished in World War 2, but the U.S. emerged with relatively light losses, most of the planet’s intact manufacturing capacity and as the world’s leading creditor, owed money by friend and former foe alike. It was to be the dawn of an American Century, in which the U.S. called the shots for the entire world. The fake history we were and still are taught purposefully erase the fact that it was the Russians, the Soviets at the time, who defeated Nazi Germany, not the Americans and Brits. Without the defeat of Nazi Germany, the last 70 years would be vastly different. To cite only a couple of possibilities, Brazil’s ruling classes were firmly pro-Nazi and Brazil has the largest black population of anyplace outside Africa. What would have happened there? How would decolonization in Africa have proceeded in a world dominated by Nazis? Today in Eastern Europe, where the U.S. has installed anti-communist and often pro-fascist regimes, the graves of fallen Soviet soldiers who liberated those places from the Nazis are being defaced. Polish government officials just hosted a gathering of 60,000 pro-Nazi demonstrators from across Europe. School children in Austria and Lithuania are being taught today that the Russian communists started the war, and Obama’s Secretary of State Hillary Clinton (along with key Republicans – it’s a bipartisan thing) directly and conspicuously aided forces that included open neo-nazis to stage a coup in Ukraine, on the western borders of Russia. Neo-nazi units are now incorporated into the Ukrainian Army. None of the U.S. antics over the last 70 years are remotely justifiable without the fake history we were taught, and still allow to be taught about the Second World War. For more than 70 years now the politicians of both U.S. capitalist parties – both U.S. government parties, have built their politics on this fake history. U.S. troops are still in Germany, still in Japan more than two generations after the war, and the U.S. maintains an empire of a thousand military bases on six continents and fleets in every ocean. Hostility toward whatever regime sits in Moscow has been the bipartisan bedrock and staple of U.S. imperial policy for a century since the Bolshevik Revolution of 1917. This week Congress passed a record Pentagon spending bill, earlier in the legislative cycle than any time since the 1990s. Most of House Democrats, the so-called “resistance” to Trump supported it, in their continuing bid to be more warlike than Trump and the Republicans. The rest of the world will do what it must, but only Americans can shut down the American empire. And we can only do that if we begin to shake ourselves free from our fake history, and face the real world around us. For Black Agenda Radio, I’m Bruce Dixon. Find us on the web at www.blackagendareport.com, where you can subscribe to our free weekly email notifying you of all new audio and print content at Black Agenda Report, your source for news, commentary and analysis from the black left since 2006. You can find our audio commentaries and our weekly Black Agenda Radio program on Soundcloud, iTunes, Stitcher or wherever you get your podcasts. Please be aware that Google and other corporate marketing platforms have asserted the right, and in the case of Google are already suppressing Black Agenda Report articles, audio and video in search results. So the only guarantee that you’re getting access to to Black Agenda Report is to securely subscribe to our email updates. This is Bruce Dixon for Black Agenda Report.